Looking for a Cypress painter who you can rely on? Since 2015, Palmer Pro has been wowing local homeowners and businesses in Cypress Texas with superior painting services and unparalleled customer service. It's tough to find a painting contractor in Cypress who can be counted on to get the job done right, the first time. Our mission is just that. To provide a consistent, reliable painting service that exceeds customer expectations every day. Call (832) 410-1868 and find out how we can "wow" you too! There isn't much that Palmer Pro can't paint. From homes to office buildings, exteriors and interiors, we do it all. If you want to refinish your kitchen cabinets as a part of an economical kitchen update, give us a call. We also paint and stain decks in Cypress and stain fences and gazebos. Interior walls naturally become dinged and marked over time (especially if you have kids or pets). Palmer Pro can quickly cover them with a fresh coat of paint. Tell us what parts of your home you want to be freshened up, and we can do it! and more! Call (832) 410-1868 for information. Whether you are moving into a new office or an apartment, want to paint your own Cypress house, Palmer Pro can help. Put our 4 years to work for you! Would you like assistance to select colors that will complement your existing decor? Not a problem. With endless options available, we'd be happy to help you select that perfect hue. Once you've chosen the colors and level of sheen, we'll get to work preparing your walls and ceilings to receive the new paint. Careful preparation is the key to a great paint job. All holes and dents will be filled and sanded smooth. Primer will be used to cover existing paint. Last, one or two coats of premium paint will then be applied to your walls. When it comes to house painting in Cypress, no one delivers like Palmer Pro. We won't cut corners or rush the prep work. Properly preparing surfaces sets the foundation for a professional, lasting exterior paint job. Exterior surfaces are inspected and any rotten wood is removed and replaced. All exterior surfaces are then caulked and sanded before primer is applied. The final step is the application of premium quality paint. Palmer Pro also stains decks in Cypress and fences using the same thorough preparations. Freshen up the exterior of your house or deck and become the envy of the neighborhood! Give Palmer Pro a call today to talk to an expert Cypress painting contractor. 5★★★★★ - "Micah did a great job on our guest bathroom. Will definitely use him again for my future painting needs. Called him earlier in the week and he was able to work around my work schedule to come out, today (Saturday), provide a very reasonable estimate and also do the work! Highly recommend." 5★★★★★ - "Palmer Pro did a fantastic job repainting my home! Their attention to detail and professionalism are second to none in the industry. I greatly appreciated their honest approach to product recommendations and pricing and am so glad I finally found trustworthy contractors to work with now and in the future. I highly recommend them to anyone needing help with their projects!" 5★★★★★ - "Micah did an AMAZING job with our paint job. He got our entire room done on short notice for a great price and also gave us some pointers for rooms we needed to paint on our own. Will definitely use again. Highly recommend." 5★★★★★ - "These guys were awesome, very professional. They made sure everything was exactly how my wife and I wanted it and even asked us to point out anything that they might have missed before they left. As a bonus it was nice that we could have a conversation with these guys and not feel awkward in our home while they were there for 3 days." 5★★★★★ - "This gentleman is professional and very attentive to detail. He does not rush and takes his time. I have an older house with the oak railings, he hand sanded them, restained, and put two coats of polyurethane on them. An unbelievable job!! I would definitely hire him again. 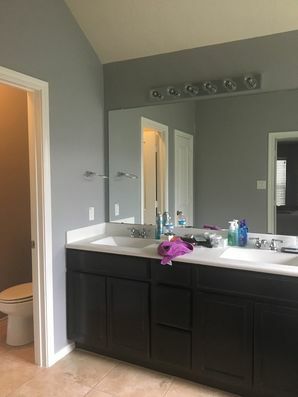 See the before and after pictures I have attached of his work, as you will see he takes great pride in his work and treats your home project as if it was in his home." 5★★★★★ - "Thanks to these two fabulous hard working young brothers we got our interior house painted in one day. They were on time, efficient, kind and very professional. We are so pleased the job completed for a great price! Thanks so much for all you do we will definitely be using you again and tell all our friends! Thanks for a fabulous job!!!" 5★★★★★ - "Micah was great! Very responsive and an excellent value for the work he provided. I felt bad because it took him a little longer than he anticipated so I gave him some extra money for his time! I will hire him again for projects at my home and business!!" 5★★★★★ - "We asked for an accent wall to be painted, responded immediately. Showed up the following day, provided a quote that was fair for what we wanted and painted the wall the same day." 5★★★★★ - "Great work, timely and thorough! Second time for hire and was pleased on both occasions!" 5★★★★★ - "Micah was on time, completed the job in the amount of time specified and did a fantastic job. Also when he recommends a specific brand of paint...LISTEN. The brand he recommended was awesome and so much better than what we used to use." 5★★★★★ - "Micah is very hard working and has an eye for detail. He did a great job with a tricky red paint. I will definitely be using Palmer Pro again!" 5★★★★★ - "Micah and his brother arrived to work on time and worked diligently all day only taking a short break for lunch. They painted my kitchen and breakfast area ceiling, walls, trim and doors. We were very happy with their work and will definitely use their services again. Did I mention also that their prices are very reasonable." 5★★★★★ - "Micah is a good painter. Takes pride in his work. On time and gets the job done. Will be using him for more projects in our home." 5★★★★★ - "He was very pleasant and respectful while in my house, very quiet and careful not to make a lot of noise. Got the job done in a reasonable amount of time. Really no complaints." 5★★★★★ - "Did a great job. Reasonably priced. Showed up on time. Would hire again." 5★★★★★ - "Palmer Pro was so professional, affordable & treated my home with the utmost of care. He even walked my dog for me! Oh, painted my entire downstairs flawlessly. Highly recommend Micah with Palmer Pro"
5★★★★★ - "Great finish work, conscientious, fast and always on time! Micah did a great job!" 5★★★★★ - "Micah and Brandon's work was spectacular! Not only were they reasonably priced, but they were precise and very detailed in their work. I could not be more pleased with my experience and will most certainly hire them for future home projects! In addition to house paint, they pressure washed my back patio, driveway and entry walk-way - another amazing turn-out! Thanks again, guys!" 5★★★★★ - "Would definitely recommend"
5★★★★★ - "he was great"
5★★★★★ - "I needed my interior house of 1904 square feet painted. Palmer Pro did an amazing job. They were efficient and kept my baseboards clean. Highly recommended if you are on a tight budget and you want it done right the first time. They even recommend colors and texture to my kitchen that looked fantastic. Called them back to help repaint when I was ready to sell my house. Made such an impact that my house sold in less than 3 weeks! Thanks, Palmer Pro!" 5★★★★★ - "Micah and Brandon Palmer were very professional and did such an amazing job. They were polite, hardworking, and finished everything within the projected timeline, which I really appreciated. I wouldn't trust anyone else with my home improvement needs!"